The Cobblers suffered an FA Cup humiliation as they were deservedly beaten 1-0 by Evo-Stik Northern League Premier Division outfit Stourbridge on Tuesday night. On a nightmare evening for Rob Page's men, central defender Jack Duggan's close-range strike four minutes from time proved to be enough for the Glassboys, and in truth it was no more than the west midlands side deserved. They were the better side for virtually the entire contest, and would have been ahead a lot earlier but for a couple of good saves from David Cornell, although it was an error from the Cobblers goalkeeper that ultimately gifted Duggan his late winner. Stourbridge now go on to face Wycombe Wanderers at Adams Park in the third round, and on this evidence they will give the Chairboys a run for their money. But for the Cobblers, this was a humbling night and one to forget.They didn't even manage a single shot on target. At no time did they look like a side that are 89 places higher in the football pyramid than their hosts, and at no time did they get to grips with Stourbridge's powerful and pacy attacking play, with right winger Matt Dodd a constant thorn in their side. Yes, the home side were direct, but they were direct with a purpose, they were good at it, and they were worthy winners on the night. Page opted to name an unchanged team from the one that beat Port Vale 3-2 in Saturday's Sky Bet League One clash, with the only change to the squad being on the bench where teenage striker Joe Iaciofano was given a place, with Kenji Gorre dropping out. After the original match was postponed 10 days ago because of a frozen pitch, there was no such issues this time, with the War Memorial Ground surface in excellent condition despite plenty of rainfall in recent days. On a clear night, the Cobblers set up in a 4-4-2 formation, with Alex Revell partnering skipper Marc Richards in attack. After a cagey opening, it was the home side who carved out the first real chance with the impressive Chris Lait attacking the heart of Cobblers defence and playing a smart one-two with Luke Benbow, only to drag his shot wide from 20 yards. He should have hit the target. The home side had the better of the opening 20 minutes, with Dodd and Kayelden Brown happy to run the channels. and the Cobblers defence were put under plenty of pressure, which they withstood. The Cobblers certainly were shirking the physical challenge, but were finding it hard to get the ball down and play, although Sam Hoskins worried the home defence with a few darting runs with the ball. The first time a goalkeeper was called into action was on 30 minutes, and Cobblers stopper David Cornell did well to tip over central defender Dan Scarr's towering header from Darryl Westlake's inswinging left-wing cross, with Revell then blocking Duggan's close-range header from the resultant corner. 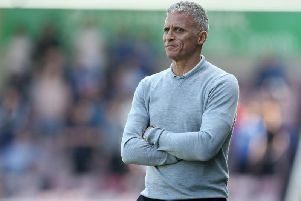 The home side were causing Town problems in the air,from set-pieces, and on 39 minutes the Cobblers had another let off when Dodd failed to connect properly with Duggan's header down, steering the ball into Conrnell's arms from six yards out. The Cobblers, who never settled into any rhythm and resorted to hitting longer balls towards Revell and Richards for much of the half, failed to create a single chance of note, but very nearly took the lead on the stroke of half-time, with Anderson's fizzing strike from 20 yards flashing just wide of Matt Gould's right-hand post. The home side will have been much the happier at the halfway stage, while the Cobblers desperately needed to up their game. There was no sign of them doing so in the first 10 minutes of the second half, and the visitors almost broke the deadlock on 55 minutes, Dodd failing to convert the rebound from close range after a Tom Tonks long throw had beend missed by everybody, including Cornell, and hit the bar. Minutes later, Cornell was again at full stretch to turn over another powerfull Scarr header, and the home side had Town rocking. The home side undoubtedly deserved the lead at this point, but they didn't have it, and as the game entered the final 20 minutes the Cobblers began to enjoy a bit more possession. Still Town were struggling to create, although it needed an excellent last-ditch tackle from the imposing Scarr to deny Richards a shot on goal on 71 minutes. A long overdue spell of possession for the Cobblers meant nothing as they still failed to force Gould into action, and it eas Stourbridge who would nick the goal and grab the glory. Raheem Hanley fouled the always dangerous Dodd on the corner of the penalty area. Town had three minutes of stoppage time to try and rescue the day and grab a replay, but Stourbridge stood firm and got their party started. Stourbridge: Gould, Green, Westlake, Tonks, Duggan, Scarr, Dodd (90+2 Canavan), Broadhurst, Benbow, Brown, Lait (81m, Gater). Substitutes: Pierpoint, Malhotra, Birch, Smikie, Hague.